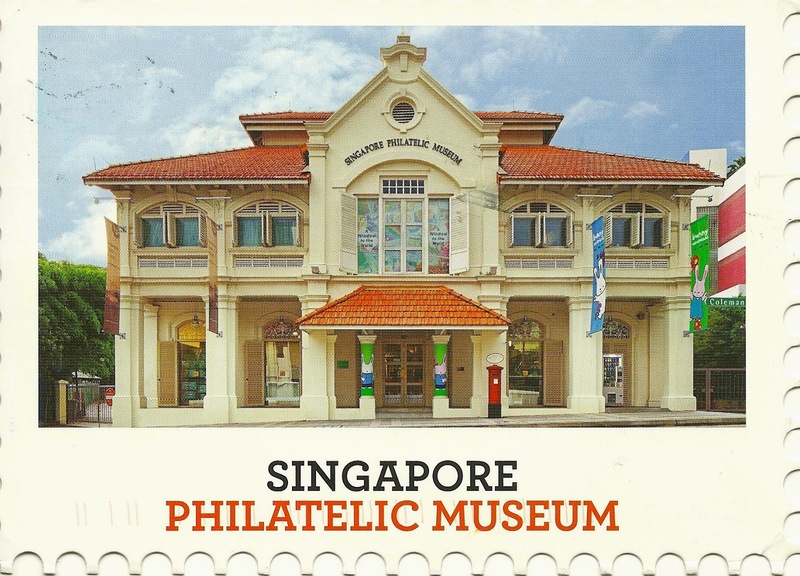 Asia-Singapore-Singapore City This was my second visit to the Philatelic museum. However it is a private company and not in association with the Post office. So you cannot buy a full selection of current issues. They have many older issues and from other countries, but at dealer prices. So a little bit disappointing on that score. Still a beautiful building. These are the current definitive issue from Singapore. I had got these in a post office nearby . Unfortunately I had not got the time to find a full philatelic counter, as I was only in Singapore for the afternoon and evening. Still enjoyed it once I got over the shock of the price difference between Singapore and Malaysia. 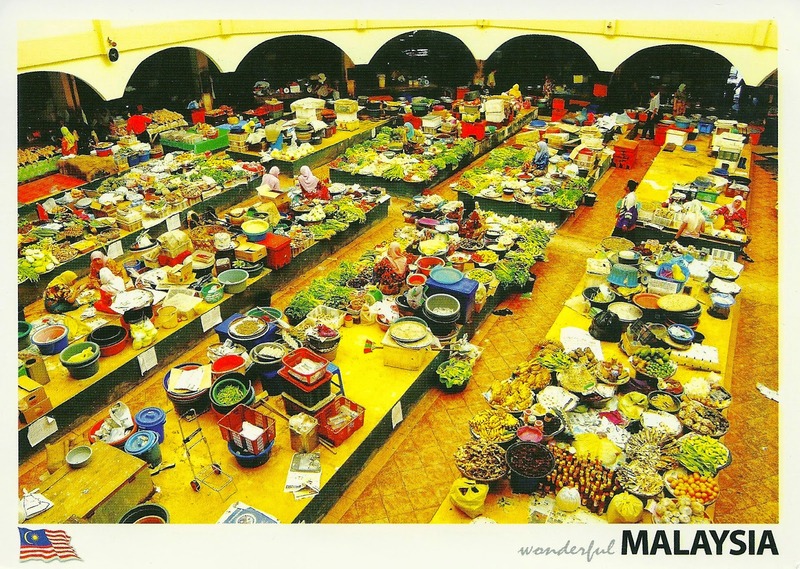 Asia-Malaysia-Kelantan-Kota Bharu Not a very exciting city , never did manage to get to this food market. 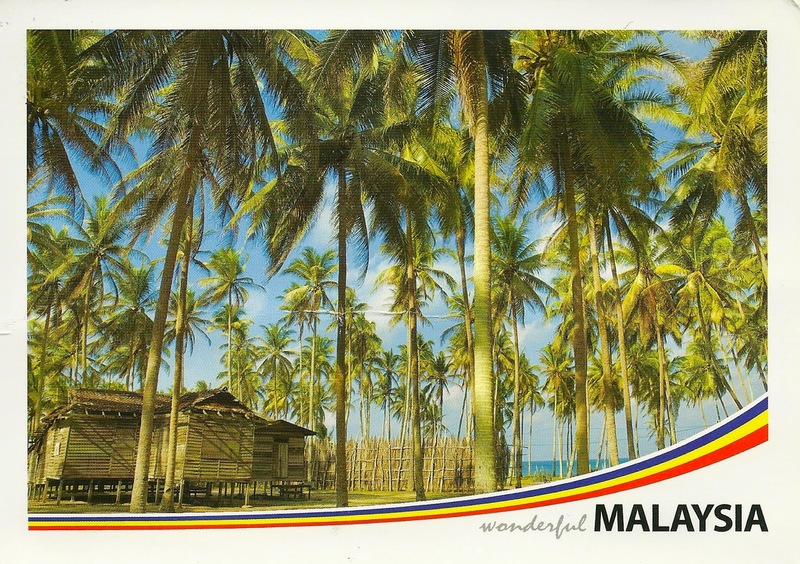 A very nice postmark from Kota Bharu. Asia-Saba-Kota Kinabalu Here is a overview of Kota Kinabalu. A nice sized city and enjoyable location to visit. These were the extra stamps on sale in the Post office in Kota Kinabalu. Asia-Malaysia-Sabah-Kota Kinabalu This is the Rasa Ria Resort near Kota Kinabalu where I stayed. Showing the Swimming pool . A miniature sheet I received from the Philatelic section in Kuala Lumpur when I purchased by mail the States stamps that were used for most of my trip. Asia-Malaysia-Perlis State-Kuala Perlis Just took a short ferry ride from Langkawi to Perlis. Not much to see here and I could not find a postcard featuring Perlis. Posted at the post office at Kuala Perlis. Asia-Malaysia-Kedah State-Jalan Teluk This beach is on the northern part of Langkawi, at Datai beach. 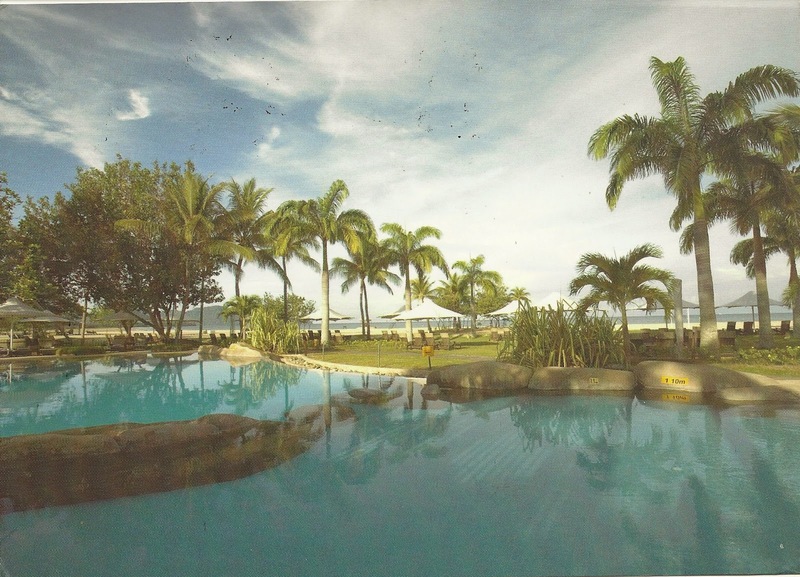 It was a very pleasant stay here and the beach was very nice. Considered to be one of the best beaches in the world, I would have to stay the beach at Radang Island was better. Posted in the village of Jalan Teluk on the way to the airport to catch my flight to KL . 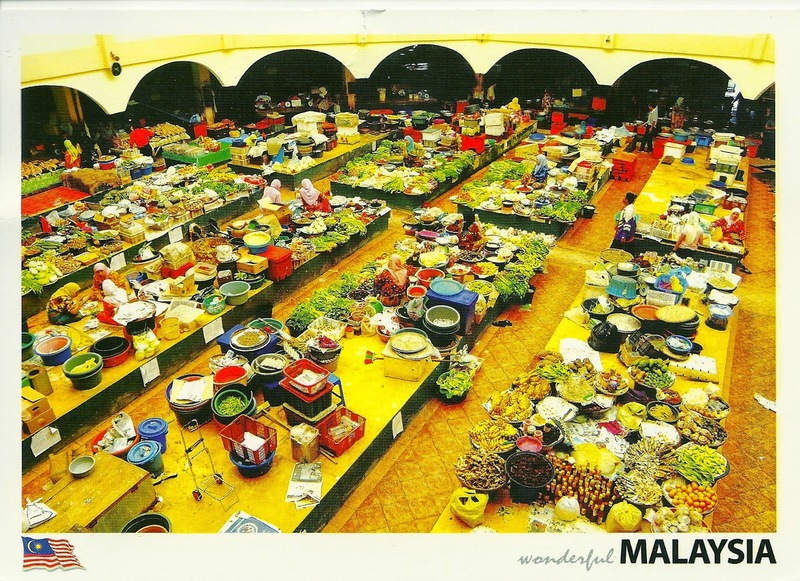 Asia-Malaysia-Pahang State-Cameron Highlands This was a part of Malaysia I had wanted to visit for many years. So delighted to get there at long last. It exceeded my expectation. Here you can see a Tea plantation , just like some of the photos I took. Nice and cool without being cold. Very green. Did go to a Tea plantation to see the plant growing and of course to sample some tea. 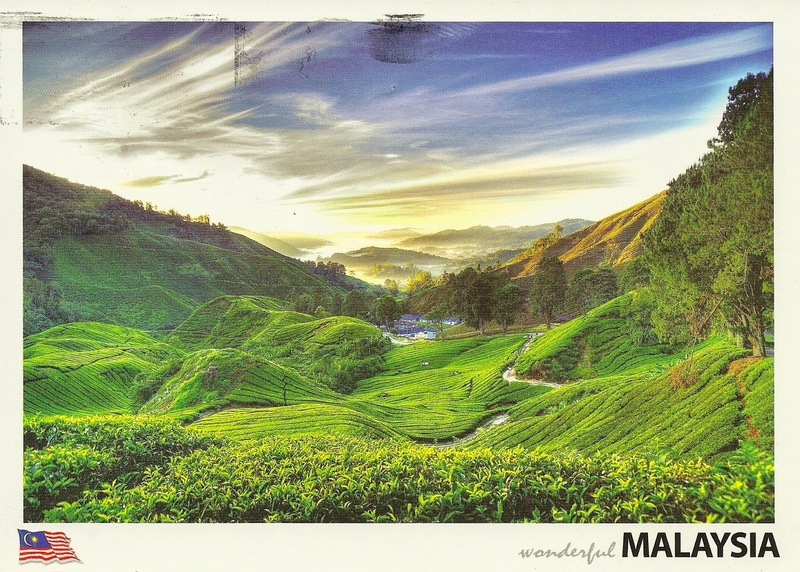 The main village in Cameron Highlands is just a moderate 20 minute walk from the hotel I was staying in. Good post office too and very friendly area. Asia-Malaysia-Penang State-Georgetown This time I stayed in the old city. A complete mixtures of old and new from China to India and all in between. Full of atmosphere. A world Heritage Site. Georgetown was the biggest Post office on this trip. 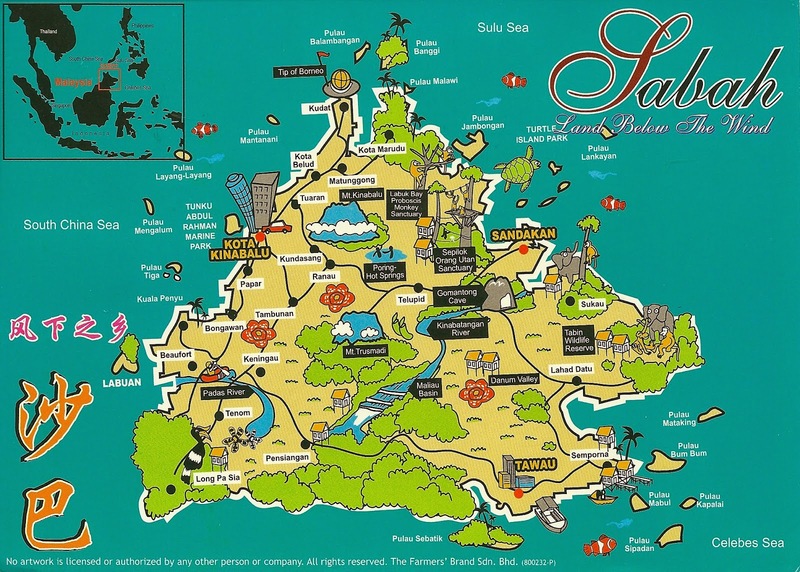 Kota Kinabalu and Kuching were also large. The Post office had some different stamps and I bought some for other uses. There were no State stamps on sale. Asia-Malaysia-Kelantan State-Kota Bharu Flew up here North from Johor Bahru. Did not manage to get to this market, but did have some wonderful food . Not a very large post office. As usual I checked to see if any state stamps but only ones from a previous issue and not necessarily from this state. 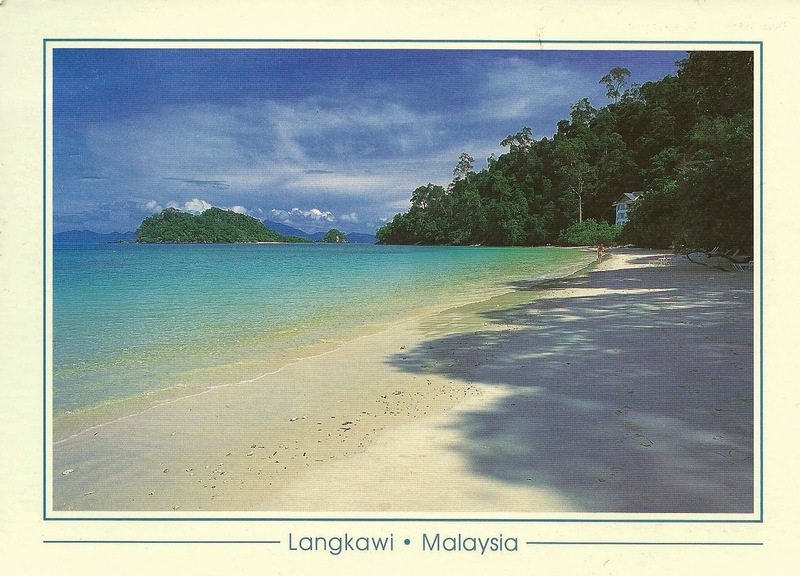 Asia-Malaysia-Terengganu State-Merang What a great part of Malaysia. But in fact spend most of the time on Radang Island. I will later put a card up from there. But great beaches in this part of the world. There was no post office on Radang Island so this was near the jetty . In fact the post office is part of a petrol station. ! 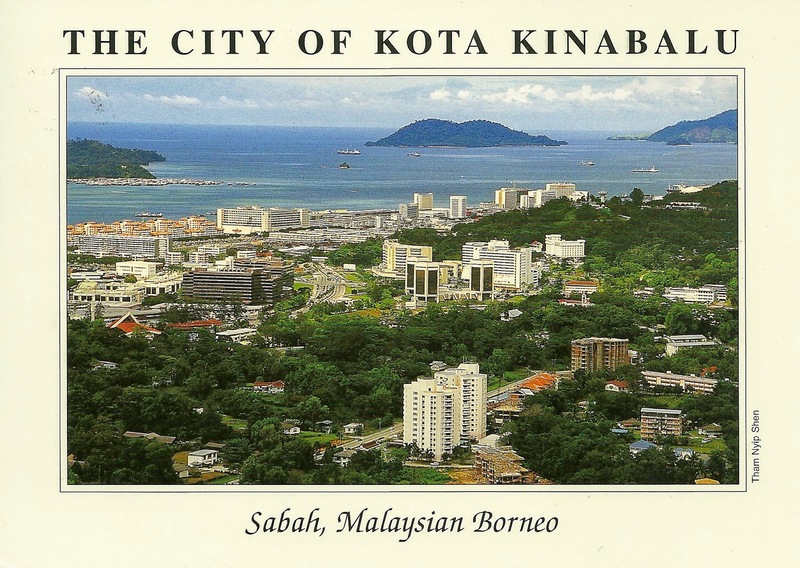 Asia-Sabah-Kota Kinabalu Taking me 30 years to get back here. I had been to the famous Orangutan reserve in Sandakan so this time just did Kota Kinabalu. That was a wonderful experience . At that time you could actually hold the younger ones hands, and walk with them. So pretty amazing. This time It was just R and R here . Relaxing. At the resort there was in fact a small Orangutan sanctuary and that was easy to get to and yet still relaxing. This is the most up to date Definitives for the States of Malaysia. I had to purchase these in advance from the Philatelic section in Kuala Lumpur just in case they were not on sale in each state. In fact they were not. 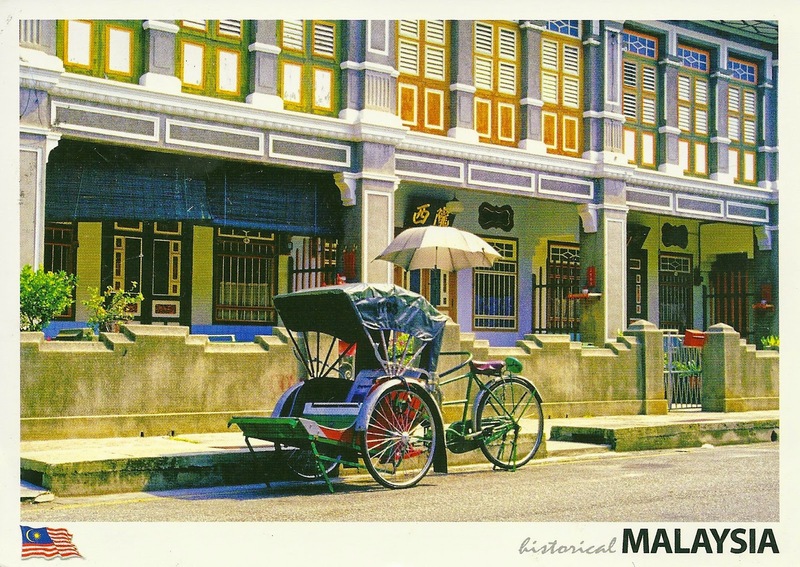 The Post offices all had different prices for postcards , from 40c up to $2. So in this case I put a additional flower stamp. Asia-Malaysia-Johor-Johor Bahru Finding a postcard in Johor was impossible so I had to use this generic card I got at a airport shop. Johor is right on the border with Singapore. So went across for the day. Only $4 by bus from Johor to Singapore. So great value. Not a lot to see in Johor , but did try and visit the previous home of the Sultan of Johor as it is a museum, but it was closed. Very impressive from the outside. In this post office the postcard rate was $1 . So I did not have to put the extra flower stamp on the card. No state stamps for sale here just flower stamps . Indian Ocean-Cocos ( Keeling) Islands- West Island This is a good card to start as it shows the maps of the Islands. 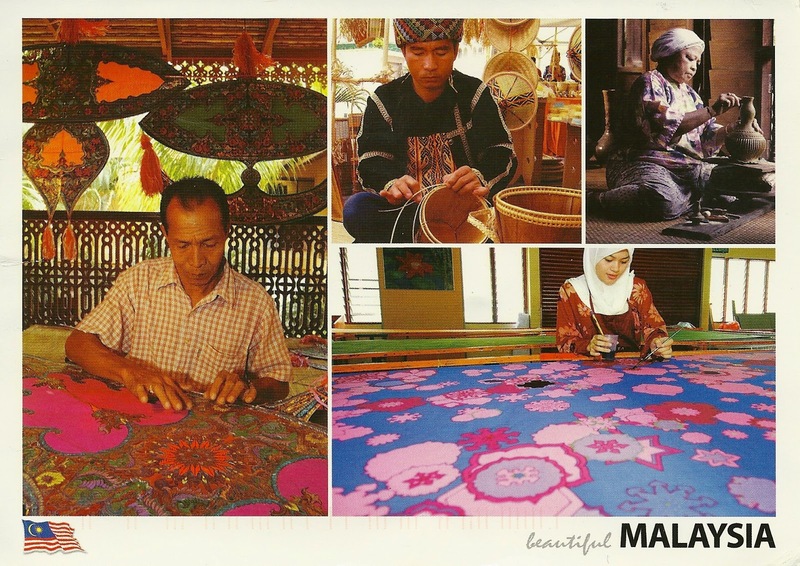 The Malay locals live on home island which was the original settlement. The airport is on West Island . 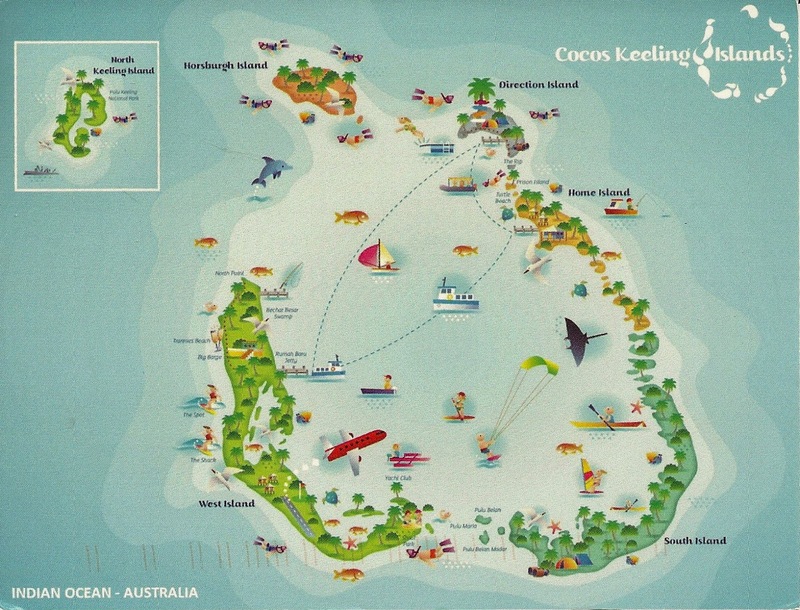 So if you want to see Cocos (Keeling) you need to see at least both islands. I arrived on the Saturday and as the flight times had changed to a later arrival everything was closed except the bar/pub? Stayed in a cottage on West Island that was beside the runway. It was very nice and only a 10 minute walk into the main area. There is one restaurant open at this time of the year and the food was very acceptable. On West Island you see mostly Australians who live or work here. The Post office was a bit of a saga here. I was due to leave on Monday afternoon. The Post office was open on Monday morning only. But I did not check that this applied to the Post Offices on both Islands. So on Monday morning went by ferry to Home Island to see the museum and see how different this island was. When I arrived I discovered that the Post office was closed on Mondays and the Post office on West Island was open until 12.00 noon. So I had no stamps and no postcards !!! I managed to get telephone the Post office on Home island to see if they would stay open 15 minutes more so I could get there but no joy. However I did manage to ring the administration office on West island and a young lady from Chile agreed to buy stamps for me so I could use. The key thing was just to buy only Cocos (Keeling ) stamps and not Australian. So I was most pleased to find the stamps waiting for me when I got back to West Island. On Home Island the museum is interesting and the development office is there. While there I took the opportunity to find out about Cocos and what is happening here . There is no major promotion for tourists . The island is really a key landing strip for Australia in the Indian ocean . You cannot get loans to buy property here as banks wont lend. You need to have cash. On home island it is really nearly 95% Malay living here that have been here since the early days of plantation. This is their home. 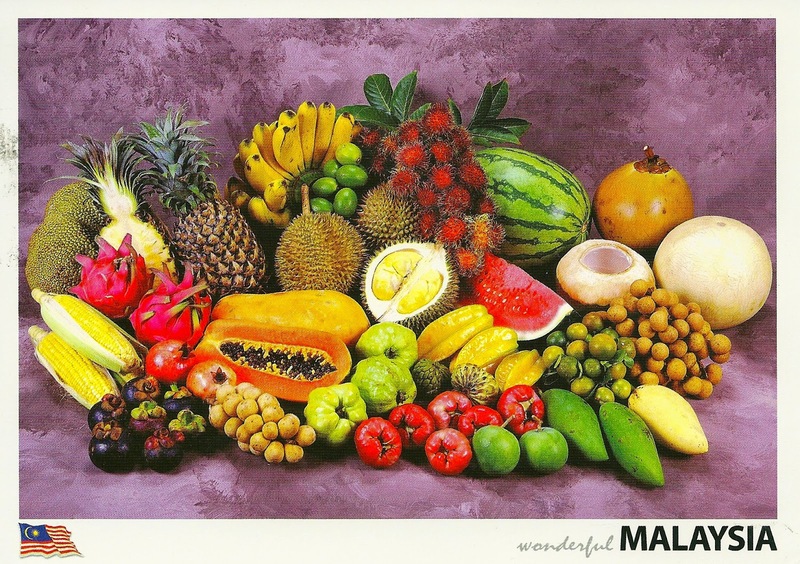 The Australian government is talking to the American government about the possibility of using Cocos as a base , like Diego Garcia in the Indian Ocean. So hence the reason I decided to come this year , just in case it got closed off to tourists. Indian Ocean-Cocos (Keeling) Islands- West Island The water is really like this crystal clear. Had a motorised canoe on Sunday and had a great trip around the smaller islands. Wonderful sand and little small fish like you see in a fish tank. So a magical place . It was worth coming to Cocos for that alone. Glad we were the only tourists in town. !!! The Post office apparently mostly had Australian stamps . So the stamp on the right was the only value they had . The lady from Chile had bought a few stamps months ago and kept them. So these are the tourist stamps you see on the left here. 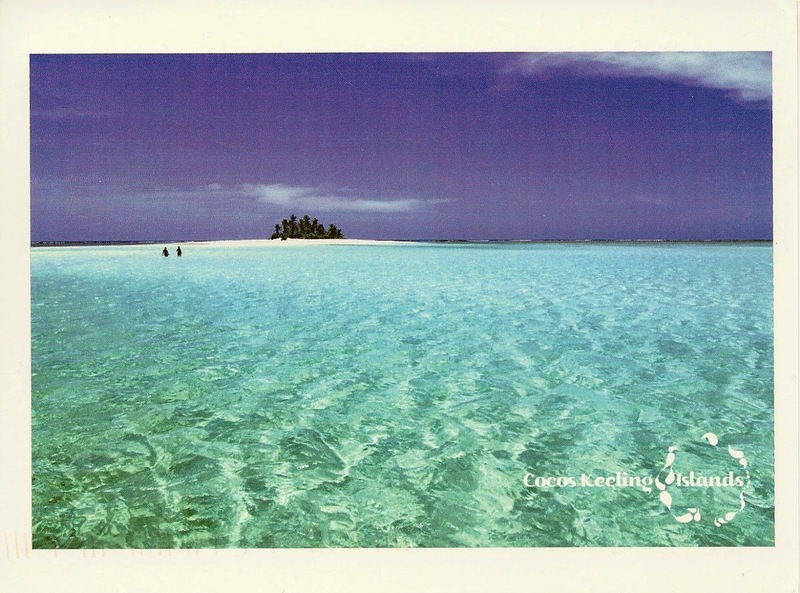 I can now understand why I got a lot of request for postcards from Cocos Keeling Islands. With a population of only 200 on West island and half of them are children not easy to find someone to send a postcard. 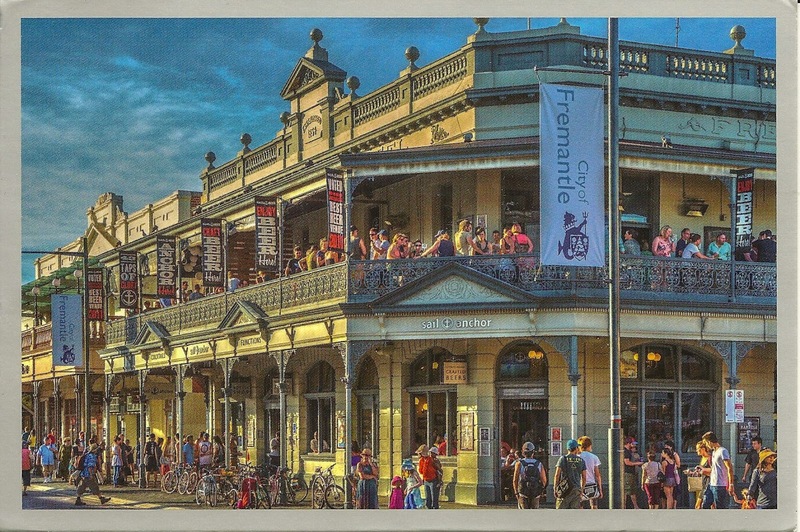 Pacific Ocean-Australia-Fremantle The old part of town looked very historic. Here you see part of the main street and the beautiful colonial buildings from the early 1900s. Got the stamps for the Post office in Perth , but a different red cancellation . Indian Ocean-Christmas Island-Settlement This is showing a view over the main Settlement which is the town were the original settlers started. Phosphate is still a big business here and you can see the same large cranes here that can be seen in Nauru. Maybe there is a connection there with both Nauru and Christmas Island having a Australian detention centre for immigrants. Was here during Chinese New Year and is a holiday on this Island due to the large Chinese population. Luckily the Post office was open Saturday morning while I was here. A busy post office. 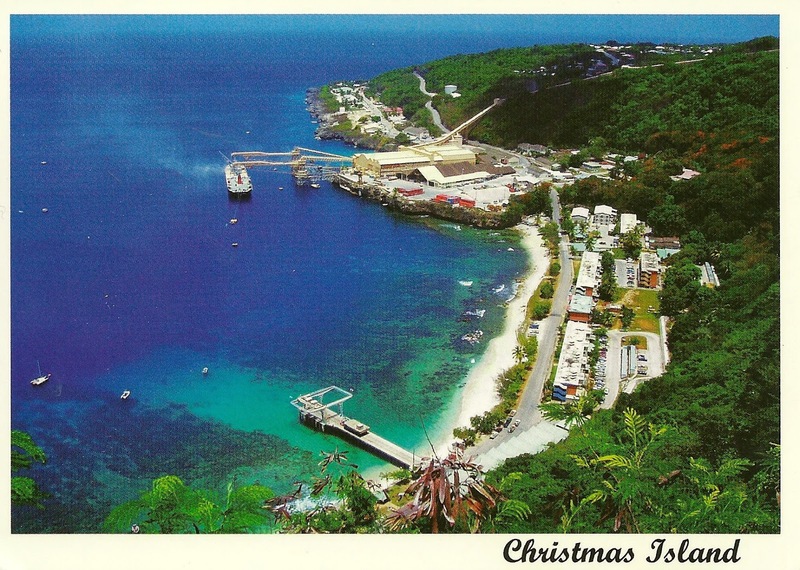 They hand out both Christmas Island stamps and Australian here. 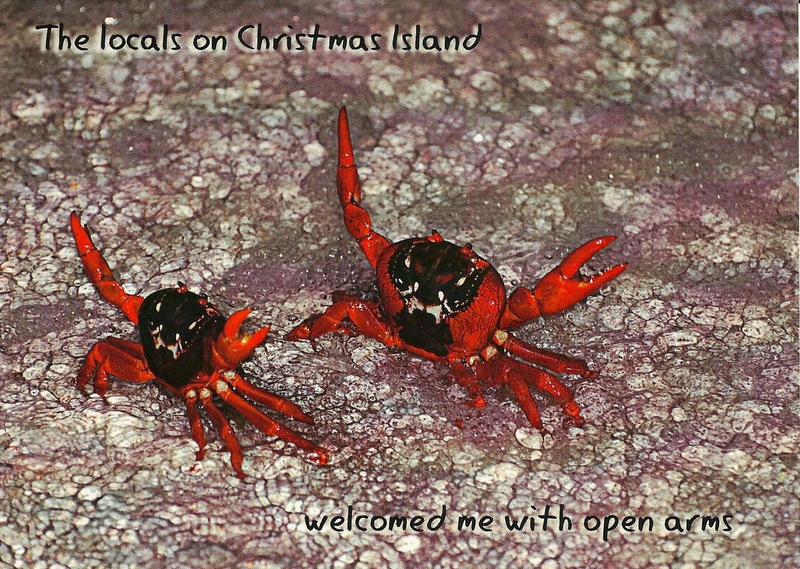 A full selection of Christmas Island stamps are available for purchase. The post office postmarks the mail when you hand it back. Two nice cancellations. Lots of nice Crab stamps here. 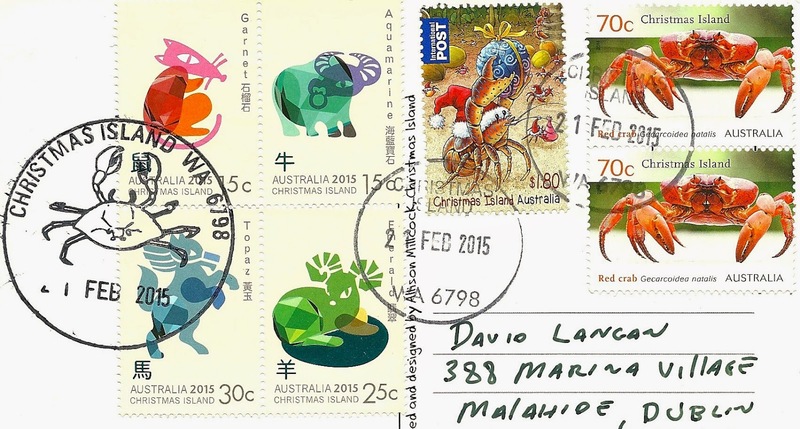 Christmas Island every year issues a Chinese new year set of stamps. Now I can understand why with having a holiday for the Chinese near year.